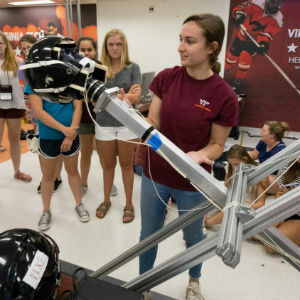 High school girls visiting the Virginia Tech Helmet lab as part of the C-Tech program observe testing on various helmets. These and other prospective Hokies will now have the option to major in biomedical engineering, a new Virginia Tech undergraduate degree program approved by the State Council of Higher Education for Virginia on Sept. 18. A new Virginia Tech undergraduate degree program in biomedical engineering couldn’t have come at a more pressing time. With the nation’s demand for health-related services, products, and professionals expected to skyrocket over the next decade, students in the program will be uniquely trained to bridge the gap between traditional medicine and the technology needed to address emerging and complex health care problems. Accordingly, the new program will emphasize technology transfer, engineering fundamentals, and hands-on learning opportunities. Approved by the State Council of Higher Education for Virginia on Sept. 18, the degree will be offered through the Department of Biomedical Engineering and Mechanics within the College of Engineering, which currently hosts both master’s and doctoral programs in biomedical engineering through a partnership with the Wake Forest School of Medicine. “There’s definitely demand for more biomedical engineers across the Commonwealth of Virginia,” said Pamela VandeVord, the N. Waldo Harrison Professor and interim head of the Department of Biomedical Engineering and Mechanics. As the fourth program of its kind in Virginia, the new undergraduate degree will seek to fill a growing niche for a curriculum in biomedical engineering that takes an immersive, in-depth approach to engineering fundamentals. Instead of concentrating instruction in biology and pre-medicine, Virginia Tech’s program requires six core courses in fundamental engineering principles. This approach means students will gain a more comprehensive understanding of broader engineering practice and cross-disciplinary teambuilding, which are both perceived as an advantage in industry. The goal is that graduating engineers can be fully integrated into diverse health care teams in order to better respond to industry needs. Graduates will be primed for placement in such fields as telemedicine, health care data analytics, personalized medicine, medical robotics, and biomedical device design and regulatory practices, among others. The department will also leverage its teaching and research partnerships with the Virginia Tech Carilion Research Institute, the recently confirmed Virginia Tech Carilion School of Medicine, and the Virginia-Maryland College of Veterinary Medicine to offer a variety of hands-on learning opportunities for students. These opportunities might include undergraduate research in the lab alongside program faculty, clinical rotations or “observation-ships” at Virginia Tech Carilion School of Medicine, or possible research collaborations and internships with industry partners. Students will also benefit from the department’s long-held emphasis on entrepreneurial practices and training experiences, such as senior design projects and participation in startup pitch competitions. Research suggests that these types of activities, dubbed high-impact educational practices, increase rates of student retention and student engagement. They also better prepare graduates to make immediate and meaningful contributions in the workplace. Ross, who joined Virginia Tech in July 2017, has research interests in the biomedical field as well as engineering education and consistently emphasizes the importance of experiential learning opportunities for students. With its translational focus on biomedical technology, the new biomedical engineering degree complements an already strong foundation in biologically based engineering studies at Virginia Tech. For example, the College of Engineering’s existing undergraduate program in biological systems engineering is ranked ninth in the nation by U.S. News & World Report and prepares students for careers in biotechnology, biopharmaceuticals, the food industry, and ecological engineering. The first cohort of 40 biomedical engineering undergraduate students, entering the program as sophomores, will begin degree-specific coursework during the fall 2019 semester. Program cohorts will grow by 20 additional students each year, maxing out at 100 students per cohort. The first Hokie biomedical engineers will graduate with the new degree in 2022.